Many enthusiasts and quality detailers use a two-bucket wash system. The first bucket holds your soapy water, and the second bucket holds rinse water. The rinse water bucket is used to rinse your wash sponge or mitt prior to dunking it in the bucket of soapy water. This method has two practical benefits. First and foremost, it keeps dirt and grit out of your soapy water where it could cause damage to your car. Second, it makes the suds in your soapy water last longer, because your car wash shampoo does not have to react to dirt you're putting back into the water. A safe alternative to using two buckets is this professional bucket system from Sonus. The patented Grit Guard sits in the bottom of the bucket, effectively keeping your wash mitt away from the harmful dirt. Make sure your car is cool. If possible, work in the shade. A hot surface causes the wash and rinse water to evaporate too quickly, increasing the likelihood of water spotting. One trick is to park on a slight incline. This allows rinse water to run off moldings, trim and recessed areas better. Start by thoroughly wetting the car's finish with a medium spray of water to remove loose grit and surface dirt. Wash the tires and wheels first. If you wash the car body first, the water will dry and spot your car before you can properly finish washing the tires and wheels. Do not use the same wash water on your car's paint as you used on your tires and wheels. Throw the dirty water out and refill your buckets. Spot treat bug, tar, sap and bird stains. For stubborn problems on your paint and other surfaces, use an insect remover or pre-wash cleaner. If the contamination has a lot of grip, use a paint-safe bug sponge. Use a car wash shampoo specifically formulated for automotive use. Look for a shampoo containing surface conditioners and gloss enhancers. The surface conditioners act as a lubricant, allowing sand and abrasive grit to slide off in the rinse water without scratching the surface. Quality car shampoos cost a little more, but are worth every penny. If you have a dark car and constantly fight swirl marks, upgrade your wash shampoo, wash mitt and towels. Use a quality wash tool. I prefer the Sonus Ultimate Wool Wash Mitt for washing. These tools have a large number of fine filaments that draw dirt and grime away from the surface being cleaned into their internal structure. Synthetic (flat-sided) sponges and washcloths can trap dirt, grit and grime on the surface, which can scratch your car's paint. Cotton chenille wash mitts and pads are also excellent, as they hold lots of soapy water and are gentle to your paint. When you're not using your wash mitt or sponge, toss it in the bucket, not on the ground. I've seen my neighbors do this and then wonder why they have so many unexplained scratches in their paint. Wash from the top down and rinse the car often. Frequent rinsing is especially important if the car is excessively dirty. 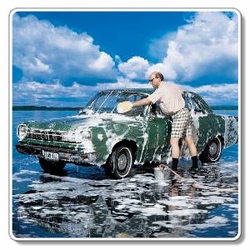 If you are washing on a warm day, keep the whole car wet to prevent spotting. I use a final rinse of free-flowing water (nozzle off the hose), allowing the water to sheet off the car. This makes drying faster.